March 2012 | What Car? 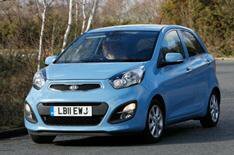 I took the Picanto to Lovekyn Kia in Ewell for its first service and was very impressed with the dealership. I elected to wait while the work was done and was out of the door half an hour sooner than they had said. The bill was also 10 cheaper than quoted at 130.03. Everything was clean and tidy, there were lots of comfortable seats and access to computers, current magazines (not two-year-old jobs), coffee, tea, water, biscuits, toys (for kids, not me), a television, fresh flowers and wifi access. The toilet was spotless, the staff were friendly and my car was also valeted. The long motorway slogs Ive been doing in the Picanto have hurtled it towards its first 10,000 mile service. Ive elected to sit in the waiting room at my chosen dealership while the work is done, and have been told that it should take no more than an hour and a half to do. I wonder if therell be wi-fi so I can get on with some emails while Im waiting. When I asked for a price I was told around 140, so it will be interesting to see how close it gets to this. If anything, if the dealership knows what its doing, I should have quoted an inflated price so when I go to pay and its less Im left with a warm feeling. I think the Kia Picanto is a fairly natty looking car, even if the slightly protruding front bumper does remind me of Keira Knightleys overbite (yes, she does have one, its massive). I also like the colour because its an almost perfect match for my football teams home strip Manchester City. It shows the dirt rather easily, but at least theres not much of it to keep clean. Since its press week, Ive not been chasing up and down the motorways. The weeks mileage is drastically down, and the car much happier on the slower local roads, but economy is pretty much unimproved at 41.8mpg. Ive spent more time behind my desk than behind the wheel recently, but in the most recent trip I needed to fold the rear seats down - a process which left me a little surprised to discover some rather exposed electrical connections under the squabs. I rather hope theyre not for anything too important, but they havent been dislodged yet in any case, so no need to panic. Only had a quick glance, but the large black plastic disc almost looks like a nice big subwoofer, which it almost certainly isnt.